As a professional chef of almost 40 years, my personal collection of cookbooks and culinary references currently number more than three hundred, many of which are classics. One of those is the 1918 collector’s edition of the Boston Cooking-School Cook Book by Fannie Merritt Farmer given to me by my mother early in my cooking career and one of the last written entirely by Miss Farmer. This American cooking reference includes over 1,800 recipes, cooking techniques, weights and measurements, and other information that was both informative and unique for that time period. Fannie Farmer, born March 23, 1857 in Boston, Massachusetts, was the first of four daughters born to Mary Watson Merritt and master printer John Franklin Farmer. The family moved to Medford, a small town 300 miles north of Boston, when Fannie was a small child. Although a good student with aspirations of a college education, Fannie suffered a paralytic stroke at the young age of sixteen, leaving her unable to walk and temporarily ending her educational goals. After several years of therapy, Fannie regained her ability to walk, although with a permanent limp. Fannie’s health continues to improve and in her mid-twenties she began working as a mother’s helper for the Charles Shaw family. It was during this time that her interest in cooking developed. At the suggestion of Mrs. Shaw, Fannie enrolled at the Boston Cooking-School under the tutorage of its owner Mary Johnson Lincoln. Miss Farmer’s outstanding performance during the next several years resulted in her being offered the position as the school’s assistant director upon her graduation in 1889, then under the direction of Carrie Dearborn. Fannie was named director two years later upon Dearborn’s death. As the school’s director, Farmer began to develop her penchant for exact recipe measurements and precise directions, the concept that ultimately made her famous and gained her the title of “The Mother of Level Measurements.” It was this driving belief in the use of standardized measurements that, in 1896, led Miss Farmer to publish The Boston Cooking-School Cook Book. It should be noted that Little, Brown & Company, publishers of Fanny’s cookbook, were not convinced that it would sell and so only printed 3,000 copies. 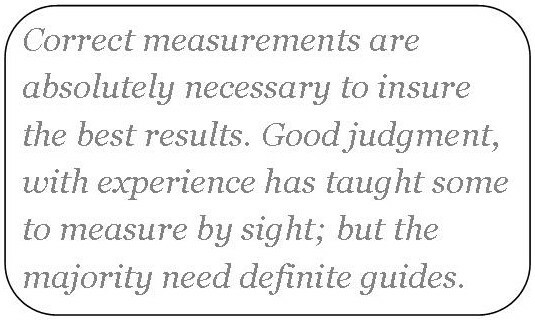 After all, exact measurements in cooking was a revolutionary culinary idea, and, to some, an unnecessary change. But the book turned out to be an immediate success and quickly sold out. Since that first printing in 1896, there have been twelve subsequent editions with more than 3-million copies sold. All but the last two editions of this legendary cookbook were printed by Little & Brown. 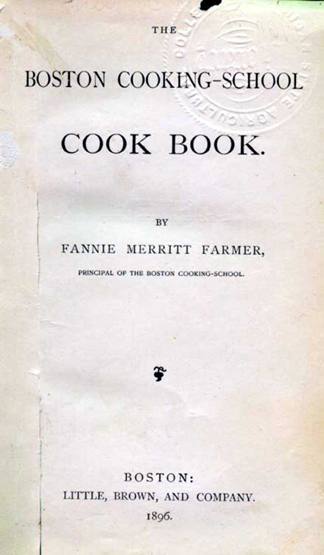 In 1902, Fannie left the Boston Cooking School to open Miss Farmer’s School of Cookery, which focused on educating housewives rather than training teachers and professionals as did her former venue. Fannie also wrote about food for various popular magazines and lectured extensively on household cookery. Perhaps due to her great insight to the needs of invalids, being one herself for a large portion of her life, Fannie eventually turned her focus on diet and nutrition for the ill and teaching convalescent diet to doctors and nurses. This work led her to publish another cookbook entitled Food and Cookery for the Sick and Convalescent, covering what to feed infants, children, adults, and the elderly. It even included a chapter on diabetics. Despite another stroke, leaving her wheelchair bound, Farmer spent the last seven years of her life continuing to write and lecture up until ten days before her death. Fannie Farmer died in 1915 at the age of 57, but her works and legacy live on today through her books and other culinary accomplishments. Miss Farmer’s School of Cookery continued with her teachings until 1944, almost fifty-five years following her passing. Buy Em: Copies of The Fannie Farmer Cook Book, including some vintage copies, are available through Amazon and other book dealers.